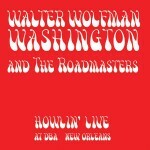 Walter “Wolfman” Washington & the Roadmasters, Howlin’ Live at d.b.a. Over the past few years, d.b.a. has been selling tickets to heaven on Wednesday nights, when two long-running residencies take place: the early show by the Tin Men followed by the magnificent Walter “Wolfman” Washington. Washington, the iconic guitarist and vocalist whose storied career dates back to the glory days of New Orleans R&B, when he backed such legends as Johnny Adams, Lee Dorsey and Ernie K-Doe, leads one of the city’s most irresistible dance bands, the Roadmasters. His latest release really captures the heady flavor of those wonderful nights when Wednesday rolls into Thursday and everyone goes home sweaty and smiling. The instrumental “Funkyard,” the opening track on the gig, is one of the band’s signature tunes. It moves along at an insistent pace, locked into a groove cut by the incomparable Wayne Maureau on drums (check his crisp one chorus break) and the irrepressible Jack Cruz, who also co-wrote several songs, on bass. Washington himself is a great rhythm guitarist and a soulful lead player in the Curtis Mayfield mold. His secret strength, though, is his sly, smoky vocal delivery, heard to great effect on “I’m Tip Toeing Through,” “The Answer Is Clear,” “I’m in Love” and “Blue Moon Rising.” The horn section of saxophonist Jimmy Carpenter and trumpeter Antonio Gambrell is a full partner in the intensity of this band’s watertight flow, alternately punching, pulling and framing the rhythm with the precision of the Red Tyler-led sections of New Orleans R&B lore. Carpenter, an extremely versatile player, manages to emulate The Wolf’s voice with his tenor tone. 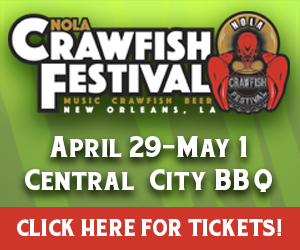 Both Carpenter and Gambrell are featured soloists on “Girl, I Want to Dance.” As long as this band is churning it out on a regular basis, classic New Orleans R&B is still alive and well.